Government of Abu Dhabi company Abu Dhabi ports hiring direct staff for various positions. Its a direct and free recruitment by the company. Attractive salary and perks are soured as per Government of Abu Dhabi terms. About Abu Dhabi Ports : Headquartered in Abu Dhabi, the capital of the United Arab Emirates, Abu Dhabi Ports is a company that owns, manages and operates 11 ports and terminals in the UAE and Guinea. Since its establishment in 2006, Abu Dhabi Ports has been completely aligned with the economic plans and directives of Abu Dhabi Government’s 2030 Economic Vision, by playing a pivotal role in the growth of the emirate, contributing 3.6% of Abu Dhabi’s non-oil GDP growth. 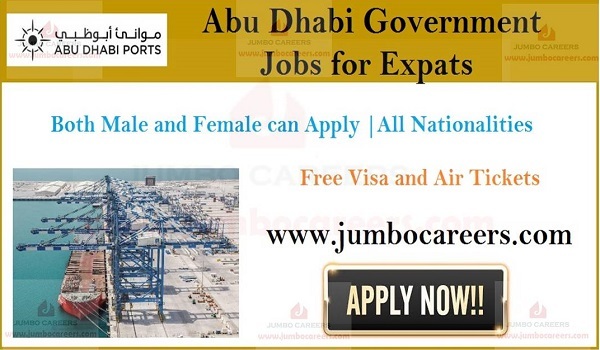 Benefits : Direct Abu Dhabi Government Job with Free Visa and Air Tickets. All Abu Dhabi government job benefits. Abu Dhabi ports comes under Government of Abu Dhabi and hence all jobs gets attractive pay package with excellent benefits. Most of the manager jobs in Abu Dhabi ports gets benefits like family status visa along with medical aid and educational support for children.